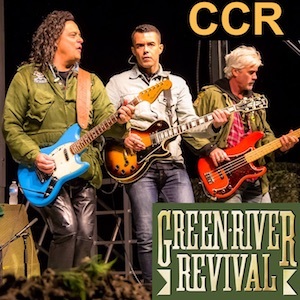 If you are searching for North America’s most authentic sounding CCR tribute, look no further than Canada’s own GREEN RIVER REVIVAL. The singer sounds so much like John Fogerty you’ll swear it is the real CCR! The members of this band have played together across Canada, Mexico and the U.S. for decades presenting the ultimate CREEDENCE REVIVAL. The show presents the music of CCR with a storyline that incorporates all of the CREEDENCE hits and includes several costume changes including those plaid flannel shirts made famous by Creedence in the 60’s and you gotta see the boys dressed in army fatigues depicting the era of John Fogerty’s Vietnam protest songs!! These boys have entertained hundreds of thousands and they are a favourite with First Nations, Casinos ,Theatres and Festivals, always delivering first class entertainment. They have sold out 8 theatres in 2018 and are now officially licensed by John Fogerty’s Record Company! For an exciting show full of nostalgia, sing-a-longs and a down right good old time, you’ve got it all with the GREEN RIVER REVIVAL! !